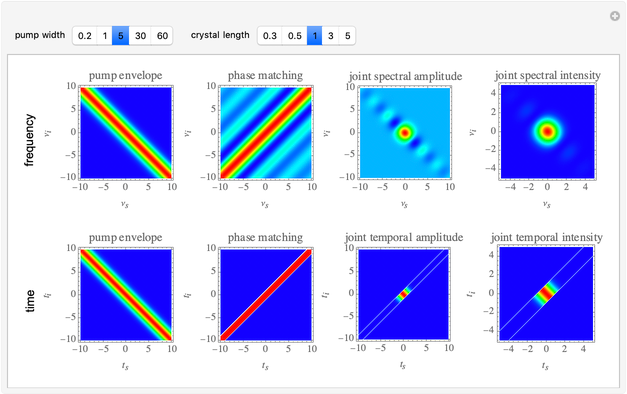 This Demonstration shows a simple example of the spectral-temporal properties of the biphotons (signal and idler) that are generated from a spontaneous parametric down conversion (SPDC) process in a periodically poled potassium titanyl phosphate (PPKTP) crystal. In the time domain, the corresponding values can be calculated by a Fourier transform. 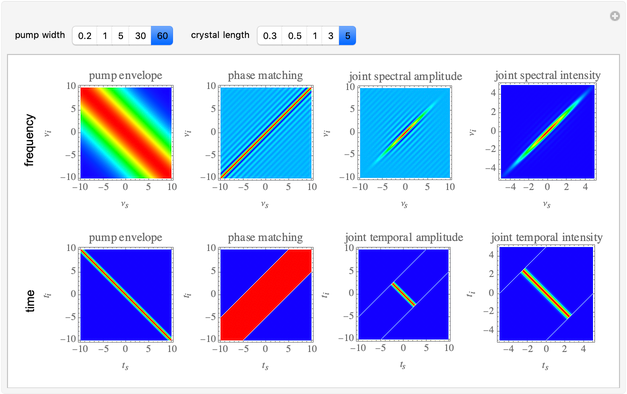 The pump envelope function is determined by the pump width (the bandwidth of the pump laser) while the phase matching function is determined by the crystal length (the length of the PPKTP crystal). 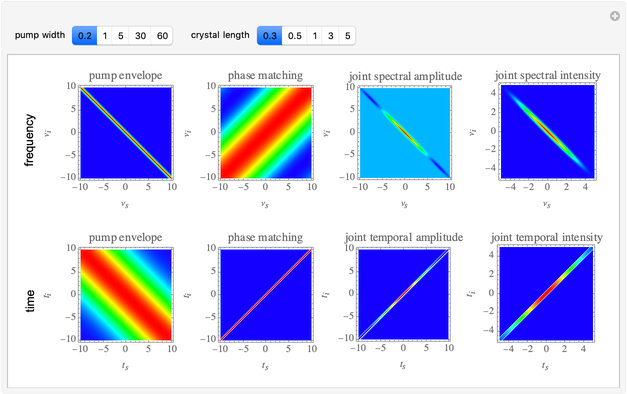 In the frequency domain, the joint spectral amplitude is the product of the pump envelope function and the phase matching function; the joint spectral intensity is the square of the joint spectral amplitude (in the case of a flat phase distribution). R.-B. Jin, T. Saito and R. Shimizu, &OpenCurlyDoubleQuote;Time-Frequency Duality of Biphotons for Quantum Optical Synthesis,&CloseCurlyDoubleQuote; Physical Review Applied, 10(3), 2018. doi:10.1103/PhysRevApplied.10.034011. Ruibo Jin "Spectral-Temporal Distribution of Biphotons from a Spontaneous Parametric Down Conversion (SPDC) Process"